Several months ago I started plotting how to get beautiful floors for not much money. I was fed up with my nasty, stained carpet but didn’t have the money for the hardwood floors I was dreaming of … or any other decent flooring for that matter. But that gross carpet had to go, so I decided to paint the plywood subfloor in my living and dining rooms. Many months later, I am finally done and I think I’m kind of in love with these painted floors! This was not a quick and easy project but it was incredibly inexpensive. And it was sooo worth the effort. Keep reading for the full tutorial and supply list. This post contains affiliate links and the beautiful stencil I used was provided to me by Cutting Edge Stencils. See my full disclosure here. 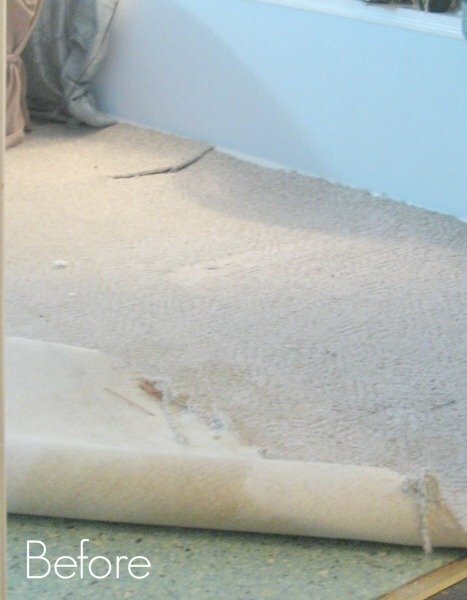 First step, rip out your old carpet and carpet padding. Remove all of the tack strips using a hammer and pry bar. There will probably also be hundreds of staples left in the subfloor from the carpet padding. You can remove these with a pair of needle-nose pliers. If there are any staples that are stuck, just pry them up with a flat head screwdriver and then pull them out with the pliers. Then it’s time to patch the seams and staple holes. (This is the only part I really wasn’t pleased with. I used Flexible Floor Patch and Leveler. This was not the right choice. It is good because it flexes with the floor and all that stuff. But it is horrible because you can’t sand it smooth). Then you can sand the floor. We just used a small palm sander but of course a large floor sander would work much faster. Just remember that this is plywood – it is not going to be silky smooth. The point of sanding is to smooth out major rough spots and smooth any wood filler you used. I used Zinsser Oil-based Primer. This is my favorite primer because it sticks to anything and is very durable. Just beware, this is an oil-based product so you definitely want to make your space is well-ventilated because the fumes can be strong. And finally, it is time to paint the floors! First, paint the background color onto the floor. I used Valspar latex porch and floor paint in ‘Chimney Smoke’. (In case you are wondering latex paint works just fine over oil based primer; you just can’t do oil based paint over water based primer. I chose to use latex paint instead of oil because it is easier to work with and easier to clean.) You will probably need to paint a couple of coats to get good coverage. from Cutting Edge Stencils which I love, but if you are looking for other stencils that are perfect for floors, I shared a bunch of my favorites here. The final step is sealing the floors. This might seem like an afterthought, but sealing the floor is actually one of the most important steps of the whole process. It not only protects all of your hard work, it also gives the painted floor that beautiful shine you expect from a nice floor. Once the paint is fully dry, carefully remove any dust from the floor surface before sealing. (A microfiber cloth is great for this.) Then carefully apply your floor sealer. I used Rust-Oleum Varathane Crystal Clear Water-Based Polyurethane in Satin Finish and would highly recommend it. 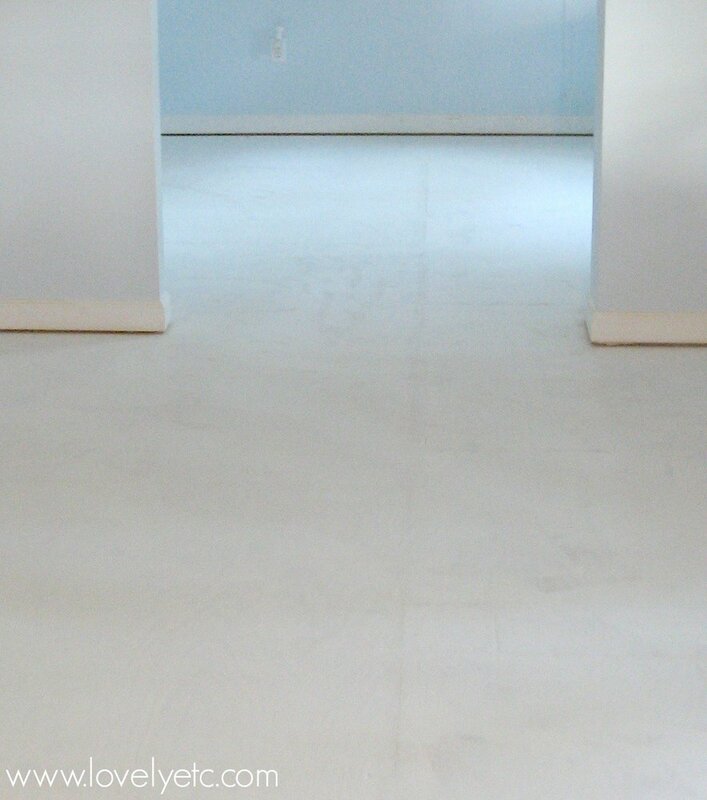 I applied it using a Varathane floor finish applicator to get a really smooth finish. I applied four coats of the sealer to make sure the floor was well protected, waiting the recommended amount of time between coats. After the final coat, I waited an additional four days before moving my furniture back into the room. That was probably longer than necessary, but I wanted to be extra sure everything was protected! I painted the floors in my living and dining rooms which combined are around 400 square feet. This process took me many weeks – mostly because it was around the holidays so I had a lot of other things going on and took lots of breaks. I would say you would need at least a two week window though, mostly because of the drying times for the various layers. My total cost was between $300 and $400. (I already had some materials on hand so it really depends on if you count those.) This total cost includes the filler, tape, sandpaper, primer, paint, and sealer. So in the end these floors cost less than $1 per square foot start to finish. Now that is a beautiful floor! And not only because it was so inexpensive. And if you are still nervous about painting your own floors, I’d love to help any way I can. You can email me with questions at thelovelyseeker@gmail.com. Subscribe for new DIY tips and projects every week and download your free guide below! I happen to be in the middle of a low budget kitchen makeover, and I am GOING to do this. Problem: I have lots of littles, and will need to set aside a full day, and get child care. How long between coats of paint were you able to stencil, and then how long after to apply the sealer, aaannnnd then how long after that before you could move everything back into place and step on it? Thanks! Hopefully you can see it in person soon. What is the maintenance and upkeep on this kind of floor?? How do you keep it shiny? etc….? Upkeep is pretty easy – I just sweep and occasionally mop. The sealer keeps it shiny though I imagine after more time has passed, it may need to be resealed. The pattern makes the floor great at hiding dust. This is the coolest project ever! We are building a house and I will be painting and sealing the concrete floors so that we can save to put bamboo in the entire house (2000sf = $$$$ yikes). I have this stencil. Paisley is my favorite. Check out my blog you will see it everywhere. I would really like to feature this post and your blog on my blog. Let me know what you think. Great job. Now I just have to convince my husband that this design will not look too busy. Thanks again for the great tutorial. Please feel free to feature my floors and me as long as you link back! 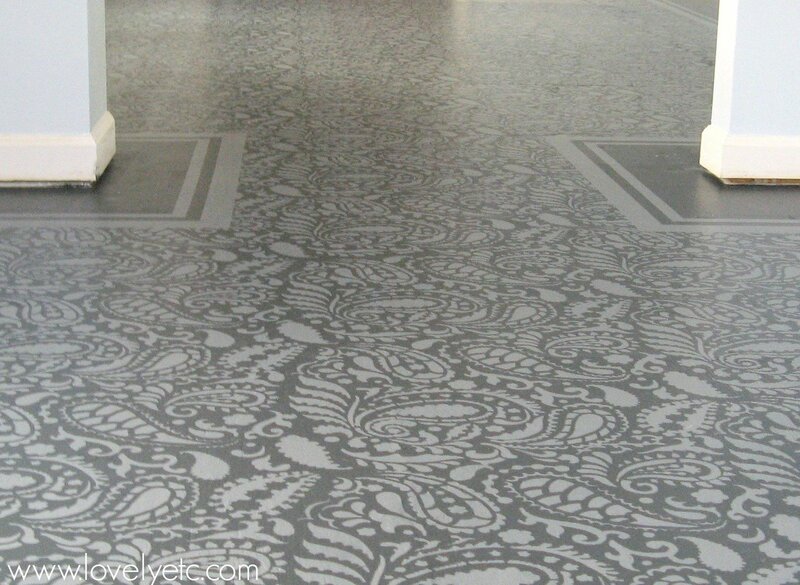 Painted concrete floors sound like a lot of fun – there are so many cool things you could do with them. 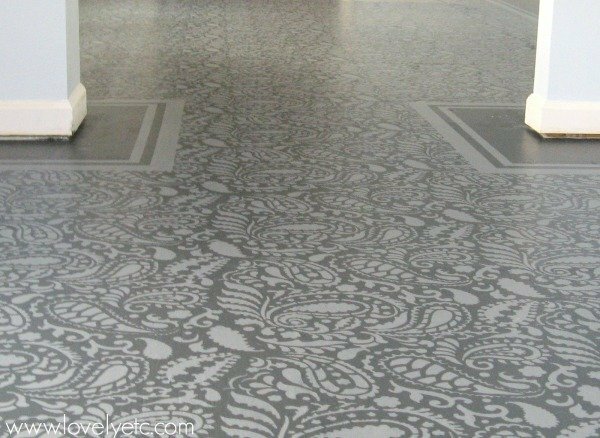 As you can see I love paisley too though I haven’t used it a ton in my house since the floors alone make such a statement. Heading over to check out your blog now! I have most of my kitchen floor in plain ply wood and this summer i will be trying to do this. How long does it take for the paint to dry because i have 5 small house dogs that are my children. I am going to do this i hope on a very hot day. This is the most amazing floor transformation and so ingenious! I wanted to let you know that I’ve featured this project (and your second tips post) on my website: http://www.DIYFunIdeas.com. It’s a hub for all kinds of fun & creative DIY ideas. 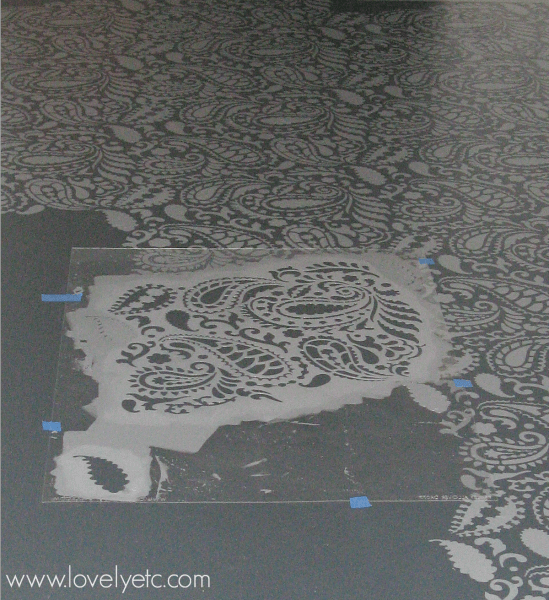 The direct link to the featured post is: http://diyfunideas.com/how-to-paint-stencil-your-floors/. Feel free to let your readers know you’ve been featured and thanks so much for your wonderful creativity! I don’t know if this is possible in a flat. You would definitely have to talk to your landlord because it involves completely changing the flooring. Good luck! Spectacular job and nice to see someone addressing a question I’ve seen asked for years! Can I paint a sub floor. Great taste and elegant look. Thanks Victoria! For anyone else who asks that question, the answer is definitely yes! The entire time I’m reading this I’m thinking, she’s crazy!! LOL and I mean that in the nicest way!! That floor is gorgeous!!!! But, you stenciled it by hand, the entire thing? WOW, you have some patience!!!! Wish I could do this…I’m not inclined, not that I “couldn’t”, I don’t have that kind of patience. I think you might need to farm yourself out and make a living out of this. Thanks Vicki! I may just be a little crazy…but it was definitely worth it! Gorgeous floor! I’m getting ready to paint & stencil my guest bedroom plywood floor. Did you use Zinsser Oil-based Primer/Sealer Cover Stain? It is not labeled for use on floors. I was wondering how it is holding up? Cyndy, that is exactly what I used. It is my favorite primer and it is holding up fabulously! Good luck on your floor project! Carrie, Thank-you! I’m starting today! You are very talented! I’m doing a simply stencil to start with. Do you have any guidance on painting OSB sub-floors? Sorry, I do not have any experience with this. What little I have read implied painting OSB in general is rather difficult though. This is just beautiful! I am about to pull the trigger and do this to a house we are moving into in 2 weeks. My big question is how do you keep it clean? Mop it? We would be doing it in the kitchen and dining room. Would you recommend this? Thank you so much!!! Thanks Jenny! Congrats on the new house. The floor is actually super easy to keep clean. I just sweep it and Swiffer/mop it to clean. I think it would work great in a kitchen/dining area. Hi, Great effect. Can you elaborate on the step 6 below as i’m wanting to know how to apply the stencil. i see it’s plastic film, but a little confused at this step. Absolutely gorgeous. Yes, a lot of work, but worth every effort. Fantastic job. Thanks so much Olivia! I definitely agree. 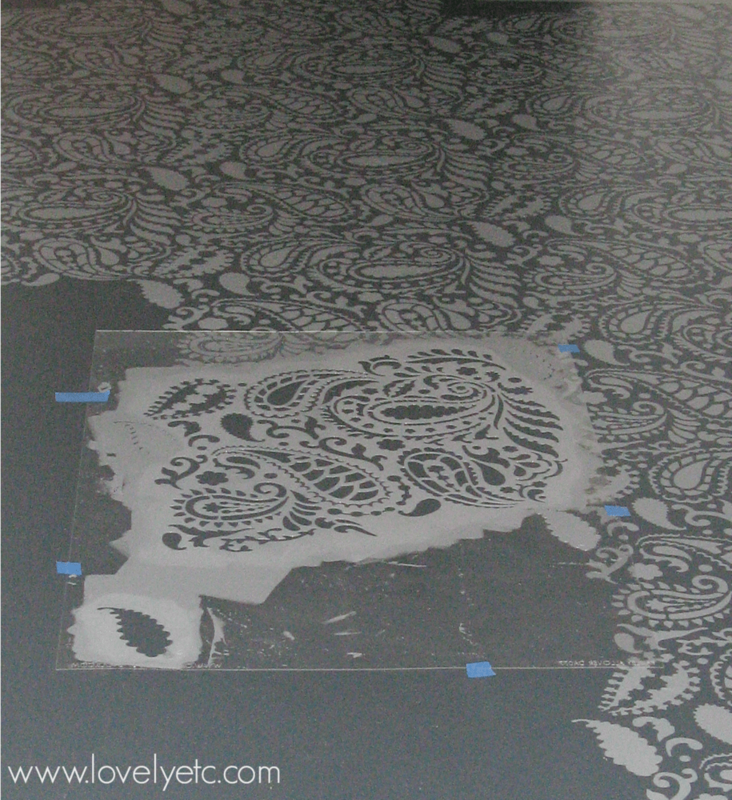 Not too sure on how the stenciling worked – do you put it down/paint over/then remove? Would this process work on concrete? My house has a slab (no basement). Yes, you put the stencil down, paint over it, and then carefully move it to the next area. 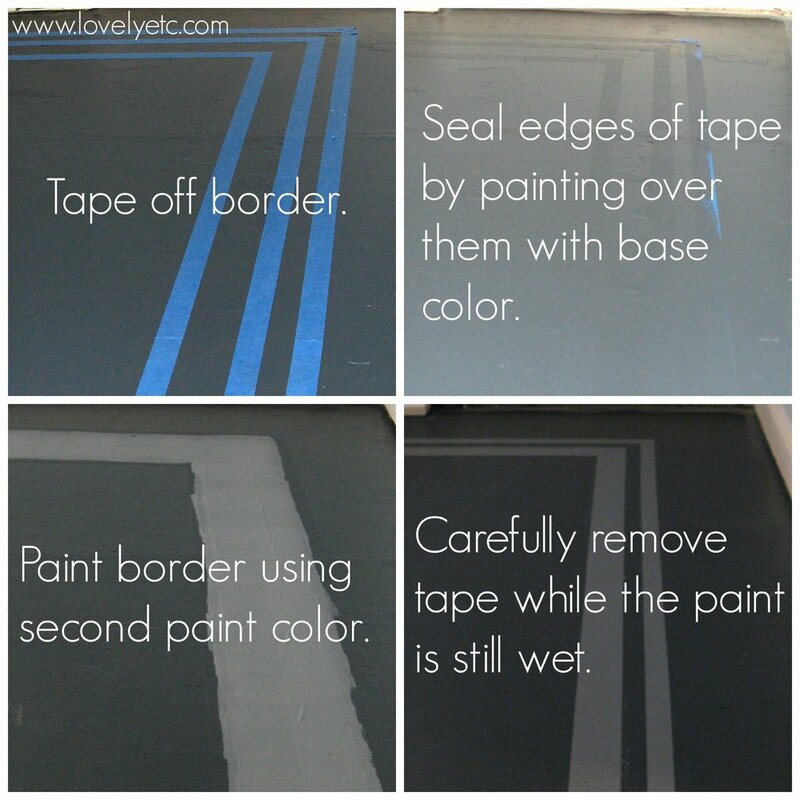 There is more info about how to do this in this post: https://www.lovelyetc.com/2013/10/tips-painting-stenciling-floor/ Also, this should work on concrete – just make sure to read all labels and make sure your primer and paint are suitable for concrete. OH my gosh – these are spectacular!!! Far exceeds how beautiful I imagined it could be. Beyond gorgeous – I’m pinning now! Your painted sub floor looks nice…. but plywood, (or OSB) sub floors are not meant to be lived on, that’s why it’s called a ‘sub’ floor. While carpeting, padding and laminates don’t add any strength, they do have cushioning and acoustic properties that add to the livability of a space, plus they help cushion any deflection that might be felt with only a sub floor in place. A finished wood floor installation will add stiffness and acoustic properties that will make your space infinitely more comfortable and livable. That said, a ‘common’ grade of solid maple, or oak wood strip flooring could be installed somewhat economically and painted, if that was the desired finished look. Plus, you’d still have the option to sand and refinish it naturally, when you grow tired of the painted look. Natural wood never goes out of style and goes with everything. Very true, but for us this was a great solution. This floor is not meant to be a permanent solution but a temporary fix. We have had these floors for two years and have not been bothered at all by lack of cushioning or acoustics. I certainly would not recommend this type of flooring long term, but it is infinitely better than the nasty carpet we had and incredibly more affordable than even the cheapest hardwoods. also meant to add: the gaps at the ends of the sheets of plywood sub floor are there for a reason and is the approved method of installation. Filling them in with a floor patching compound is not a good idea. I painted my kitchen floor years ago – all has gone well – a couple of seams popped when the washing machine overflowed (and I wasn’t around to shut it off) and saturated the kitchen and adjoining dining room. But I’m the only one who really notices the “ugly” part of that disaster. 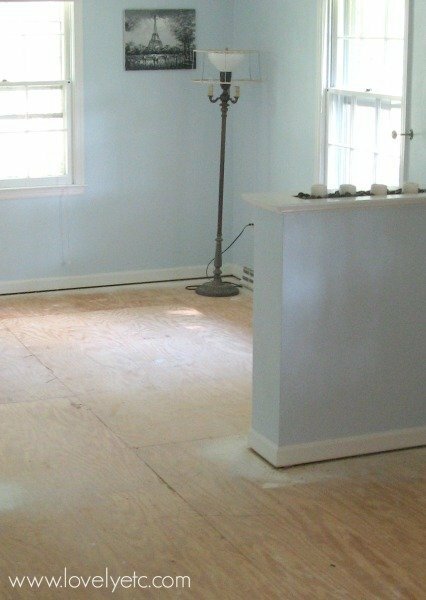 Want to paint the den; a quick peek shows that the subfloor is not plywood, but that ugly ugly OSB stuff. I always called it chipboard but was corrected. Do you think this subfloor will can be satisfactorily painted? OH, My approach to the kitchen was similar to your’s, but instead of stenciling I sponged on 3 colors. Hi, I just came across your blog while googling “painted floors”. I was looking for the “how to”. I want to paint our little boys bedroom floor. Well let me just say FABULOUS !! Fancy and LOVE it !! Brilliant it’s clean & so fresh looking. By far the best I have seen yet !! Very inspirational. I will definitely be a follower now ! Thanks Lynn – good luck with your boys room! Your floor looks amazing. I also love the wall and that chandelier! Thanks! Everything is a huge work in progress but I am loving where things are headed! We painted ours with Oil base porch and floor. The smell stayed inside for weeks, months even. I think I may get some laytex and paint over it next time after it dries to try and contain the smell. Oil-based paint is great but you are right. The smell can be intense! I always add a tsp clear vanilla extract to a gallon of paint and it almost 100% eradicates paint odors. Just used enamel oil paint in kitchen cabs. Worked great. Also, the dark vanilla doesn’t effect color if that is all you have. This is an amazing paint tip! Thanks for sharing! Love that idea! Sounds beautiful! Just saw the pic – so pretty. Beautiful! I love the paisley pattern. I am wondering if I could do this on some concrete that I have outside. Sandra, I haven’t painted a concrete floor before but I know that you definitely can! I have 15″ ceramic tile floors with a little bit of texture in my living room. Have you ever known anyone to successfully refinish/paint them? I’ve seen lots of tutorials for painting tile but I don’t remember off-hand if any of them were for tile floors. I am pretty sure it can be done – even linoleum can be painted! – I just don’t know what the best primer and paint to use would be. Lori, great question and congrats on your cottage purchase! The tape wasn’t hard to remove at all. 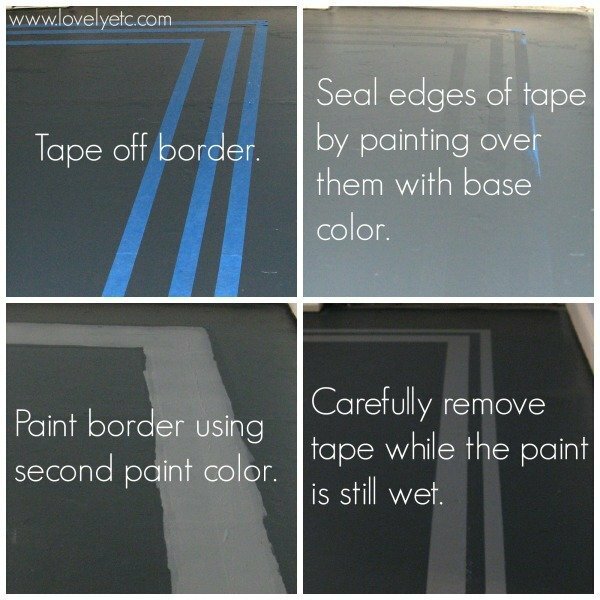 As long as the final coat of paint is still wet when you remove the tape, it should come off fine. The motorhome floor is carpeted, and I hate it. There’s simply no way to keep the carpet clean, and I desperately want to get rid of it. I’ve thought of putting laminate on the floor but as you may know, almost everything in an RV is built in. Putting new flooring down would mean tearing out all the furniture, then replacing it when the floor is finished. We’re not willing to tackle such a project in our mid-70s! My question to you is…Do you know of anyone who has used your painted-plywood-subfloor method in an RV? I am pretty sure it would work well, but I’m wondering about sanding, painting, etc., in a relatively small, enclosed space like this. Any special tips on doing this while continuing to live in the motorhome? It’s our home, after all, and we can’t just move out while completing such a job. One good thing is that it’s just the two of us old folks, with no kids or pets to be harmed by the fumes, etc. Bev, First of all I love that you are living in your motor home! I think this is definitely my husband’s dream too. I’m not there now but maybe one day – there are definitely a million places around the country I want to see. I don’t personally know of anyone who has used this in a motorhome/RV, but as long as there is some decent plywood under the carpet, it should work. The good part is it wouldn’t take a huge amount of time in a small space like that. The downside is, like you said, it would be difficult to still live there while working. I think it would be doable – the main problem would be not walking on the floor during drying times but if you were able to do the painting/sealing parts fairly early and stay outside or go somewhere for a few hours while each layer dries, it could work. And I’m sure it would look beautiful! Another option would be to try some of the peel and stick tiles out there. I have seen some that look really similar to real wood or tile floors and you could just stick them down around the built in furniture and cabinetry. I am pretty sure you can just cut them with a utility knife which would make working around things pretty easy. Whatever you decide, good luck! How long did it take for you to do all the coats and for the floors to cure? Poly has a faster curing time than regular porch paint, right? We are planning on painting our subfloor before we move into our new house. This was a project I was only able to work on in the evenings after work so it took me a lot longer than it could have. I let each coat of primer/paint dry for an entire day since I was only working in the evening, but you could potentially do a couple of coats a paint in a day. You do want to let it dry a bit longer than you necessarily would with paint on the wall since you will have to walk on it to paint the next coat. I believe the sealer I used could be recoated in four house and I did a total of four coats. But then I left it for several days to let it fully cure. Start to finish, you could definitely get it finished in a week if you really timed things just right. I also am in need of flooring which isn’t in my budget. I mentioned painting the subfloors to my husband and he thought I was crazy. I can’t wait to show him this, great job! Thank you! My husband also thought I was crazy but luckily he wanted our carpet gone as much I did! Great stuff! Were you planning on doing anything with the floor trim? Like lowering it? Thank you Ed. I did eventually add shoe molding to the base boards at the correct height. It definitely helps the room look more finished. Carrie, Your floors are absolutely BEAUTIFUL!!! Beyond belief and I’m so glad that you aren’t letting the neigh sayers get to you. The floors are SO STUNNING!!! There are no words actually to describe how BEAUTIFUL the floors are!! WOW!! Is as close as we can get. 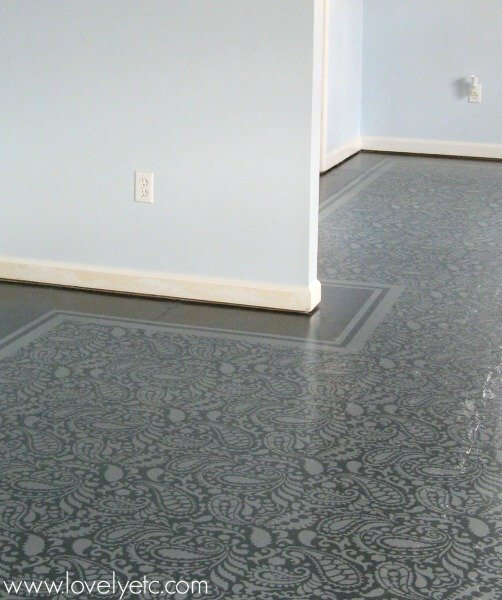 I’d love to do this to my floors, and we’re renting. But our landlords already given us permission to remove the carpet that’s on the floors as it’s so old that it’s coming apart in chunks. He gave us permission to put in laminate floors and he’d pay for it, but we’re going to do the labour to help save and not have strangers in our home going through our stuff. SO BEAUTIFUL!! Thank you so much Kim! I’m glad your landlord is letting you get rid of your carpet and put in laminate floors. Nobody should have to live with gross carpet! Absolutely love it! Do you think it’s possible to do this project with chalk paint to avoid needing a primer? Leah, possibly. I know some other bloggers have painted their floors with chalk paint. Personally I probably wouldn’t choose chalk paint for such a high-traffic surface. But you possibly could with a good sealer. I copied almost every detail on my bedroom floor and it came out great. Thanks for the excellent tutorial. Yay, I’m so glad it worked well for you! Any suggestions for covering unwaxed commercial tile? Getting ready to start and I’m nervous LOL. Good question Rebekah! I haven’t painted tile so I can’t say for sure what products to use but I know it can be done. Good luck! This is amazing! What a transformation. The color is my favorite. Hey!! Love this post! I want to rip up our nasty carpet (we have 2 large dogs and a red clay/dirt yard) and stain the subfloor. Eventually, we will get hardwood but that’s not an option right now. My husband is worried about the lack of insulation without the [old, dingy, gross, orange] carpet affecting our heating and cooling bills. Have you seen any major changes in that area? We didn’t see any changes in our heating/cooling bills. We have electric heat and have a full unheated basement under this floor. We also live in VA where the temps vary quite a bit. I hope that helps. How well did these hold up over time? I’m thinking of doing something like this on the house I’m buying as a temporary measure to avoid dropping $800 on flooring right away. Did you find it to be excessively noisy or otherwise annoying to walk on? 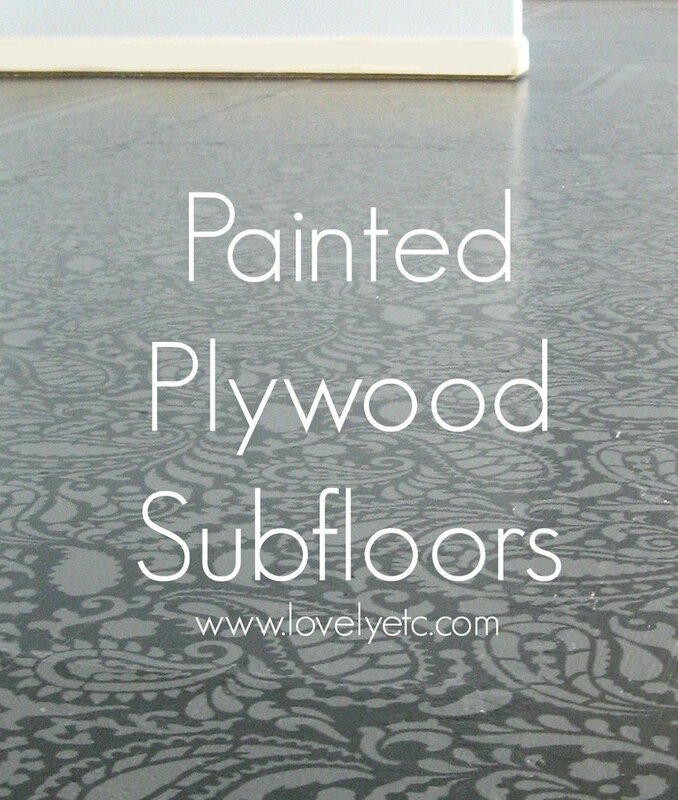 Great post, pinning this amazing floor project.